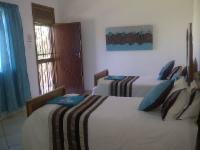 Its a large spacious room with 2 3/4 beds, aircon, DSTV, barfridge, seperate bathroom with shower and bath. And its also equipped with wireless broadband internet on request. Its a large spacious room with a very relaxing feel to it. With the white linen, curtains and tiles this should be a stay to remember. Its equipped with 2 3/4 beds, barfridge, aircon and shower. Its a large spacious room with a very relaxing feel to it. 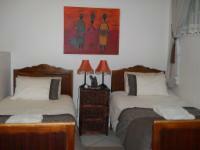 With the fresh crisp linen house linen, curtains and tiles this should be a stay to remember. 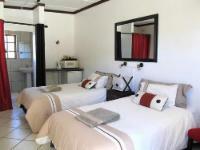 Its equipped with 2 3/4 beds, barfridge, aircon and shower. If cancelling 7 days before arrival, forfeit 100% of the deposit. If cancelling 14 days before arrival, forfeit 50% of the deposit. If cancelling 999 days before arrival, forfeit 25% of the deposit. 50% Deposit to secure booking. Full payment on arrival.